We had an early morning reservation for a walking tour of Lotusland, so we had a quick cappuccino on the roof and then got totally lost-per usual- on what should have been a five minute drive. ( No more easy HWY 101 directions.) 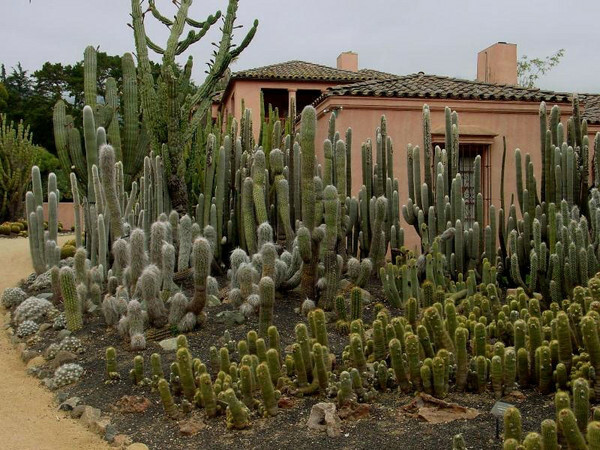 There’s probably nothing worse than a bossy writer, however, anyone visiting within 100 miles of Santa Barbie MUST make it a priority to check out this 37 acre botanical wonderland filled with rare, exotic cacti, palms, aloe, and brilliant tangled tropical plants. Tip: wear comfy shoes, sunscreen, bring a hat and water. Lunch was just minutes away at the renowned Montecito Cafe, located inside the historic Montecito Inn, in (no-duh) Montecito-a charming town filled with the rich and famous. It was built in 1928 by silent screen mega star, Charlie Chaplin, so the little fellow could entertain good friends. Everything they serve is scrumptious and made from scratch-even the hamburger buns. Start with the ethereal Goat cheese pancakes anointed with gravlax and golden caviar and end with a slice of the house favorite homemade coconut layer cake for yummy repast. Enough culture–we’re off to the Circle Bar B. 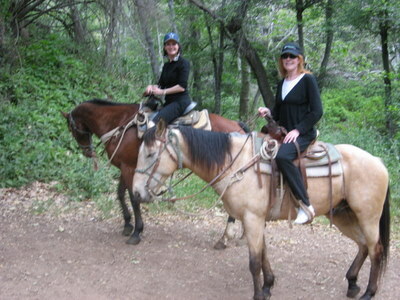 Guest Ranch and Stables nestled inside Santa Barbara’s Refugio Canyon. This cowboy hideaway is the real deal where four generations of the Brown family (still running the show) have lived the horsey good life. Our guide, Francis, a renaissance dude who spouted literary quotes while he slapped on a pair of chaps, saddled us up then kept us safe and entertained on our ride through the Santa Ynez moutains, past fern-lined canyons, streams, and waterfalls, culminating in a magnificent view of the Santa Barbara Channel Islands. Recent ranch renovations include a fabulous new lodge with a top shelf saloon, a library, outdoor swimming pool, and choice of accommodations: cabins, lodge or hillside homestead. Wifi access, good food, massages, even a popular dinner-theater round out their offerings making the ranch a perfect choice for a girlfriend get-away, bachelor /bachelorette party or family reunion.